Mr. 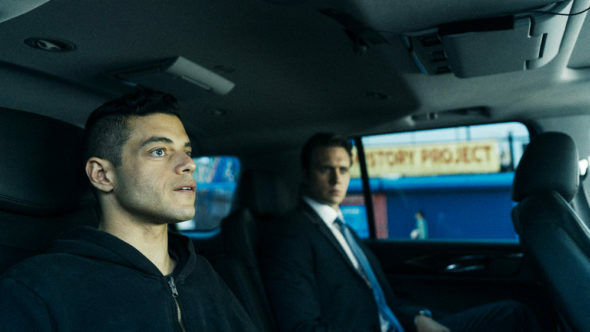 Robot TV show creator, EP Sam Esmail, is teasing the upcoming third season of the drama series. USA Network renewed Mr. Robot for season three, back in August. While Angela’s (Portia Doubleday) story ended on a cliffhanger, last night’s finale of the psychological thriller included a big reveal about Tyrell Wellick (Martin Wallström). The Mr. Robot TV series cast also includes: Rami Malek, Carly Chaikin, and Christian Slater. WARNING: Spoilers after the jump. For me, it’s to what extent we should be wondering about White Rose and her connection to the Washington Township plant. Is that a thread that still needs to be explored? It is a thread that needs to be explored, but the big question is: What is going on in that plant? Why does she care so much about it? Also, what did she tell Angela to convince her of that? Obviously — and I’ll say this right now, on the record — those questions will be answered in due time. Not every episode can answer every question, but those are the big, overarching mysteries of the show. The White Rose and plant of it all is something that harkens back to the beginning of the series. I think it will always be looming throughout the series and as we go into the next season. When it comes to Angela and it comes to the characters, those are the questions we want to answer more satisfactorily. Literally in the next season, we’ll start to unravel those motivations and what did happen to Angela in those 28 minutes. We’ve previously talked about how the production schedule had been shaped to allow you to direct every episode. How do you think that went, and how will it affect production going forward? For me, it went extremely well, except that — [laughs] — I was on little-to-no sleep every day and had zero life. Creatively, I think we accomplished everything we set out to do and then some. There’s a cohesion that wasn’t quite there in the first season, and the execution, I think, was a lot stronger in the second season on a production level. With the complicated, byzantine plot that we have, with characters and their motivations all over the place, it really did feel like you need that central person in the middle to traffic any sort of questions, whether it came from costumes or the cast or whomever. This is an extremely layered show, and so it would get complicated very quickly. The decision was still the right one, and even going into season 3, I’ll be doing it again. On that level, aces. On a personal level, I really need to get some sleep. What do you think? Did you enjoy the second season of Mr. Robot? Do you plan to watch the third season on USA Network?